Lately, every time I step into my closet I get overwhelmed with the unknown. What do I really have in there, how much of this stuff is useless to me? I’ve been thinking about re-organizing my closet lately but was not inspired until the first day of spring. I’ve been reading blogs about the minimalist life, in particular, the minimalist wardrobe. I’ve always loved the idea of living with the least amount of worldly stuff. However, lurking in the back of my mind was the secret fear – finding out how many clothes did not fit me anymore. The fact that I probably could not fit into some of my clothes did not just come to me yesterday. I noticed for years and every time I’ve try something on to wear out. Why I am I trying on clothing in my own closet? It should fit, right? I mean – it did fit in the store when I tried it on then. I should be able to just walk in my closet and pick out what I want to wear. Like many people, I have a problem admitting weight gain and letting go of things that once made us look and feel good. It’s hard to think of the money spent on these clothing – to rid of things before getting your money’s worth out of it. In truth, keeping those items in my closet is just a reminder of what is not anymore. These too-small clothing were the ‘elephant in the closet’. I little depression and anxiety would take over me each time I stepped into the closet. I’ve had enough – I will not fear my closet. My wardrobe is getting a spring cleaning, a purge! I did not think of writing about my closet cleansing until the morning of. I was not sure exactly what angle of idea to write. Maybe a how-to closet purge and then re-organize tutorial? No, there’s plenty of those already. Does the world need one more ‘expert organizer’ telling them how to color code their wardrobe? After the purge I knew that I would write about it. The focus would not be about how I did it but why I did it. This experience was not just about freeing up space in my closet. It was about freeing my mind from a certain emotional baggage. I hope you will be inspired to let go of stuff that takes up space in your life, physically and mentally. Remove every item that I don’t like any more, regardless if it fits or not, the what-was-I-thinking items. Remove every item that I already know doesn’t fit anymore, regardless how much it cost or the designer label attached. *That gorgeous silk Oscar de la Renta dress I scored from the clearance rack way back in 1999 for $120 –the waistline even can’t fit past my hips today. GONE! The $39.00 Nicole Mill Dress.. I miss this dress already. I envy that future Goodwill shopper who will score this dress! That silk Nicole Miller dress that was a little too snug (but promised I would lose the weight to get into it) back in 2005 – had to have it because it only cost $39 -mark-down from $340 -what a steal! …Never did fit into it. Still have the tag boasting my great deal. What a waste of $39. GONE! And what about that cute wool dress from Banana Republic with the ripped seam in one of the pleats and the ‘Damage Merchandise’ tag with the awesome discounted price? That an easy fix. I’ll fix that as soon as I get home…five years later!! Here’s the sad thing. 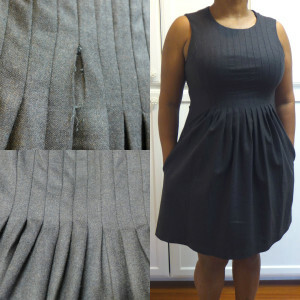 I finally stitched up that pleat today. It only took 20 seconds, kid-you-not. Guess what? It doesn’t fit anymore- I barely got the zipper up. GONE! Try on what I think may not fit me anymore. Get on the Spanx, my best bra and try them all. Take a good look in the mirror. Be HONEST. Does it look and feel right? Is it a comfortable? Am I smiling? No? GONE! Remove those unhappy items from my space. Feel a smile coming on. Go back into my closets, my NEW wardrobe. Everything fits. Smile. Finally, re-organize, quantify and evaluate.The first thing I decided to do was count items I would remove from my wardrobe to get a number. Then I thought an overall percentage will be better if I counted what I kept as well. As I started the purge I realized I should categorize, quantify and chart everything. A picture says a thousand words. A chart state the facts, the big picture about my wardrobe. What the chart says about my purge. First, about the closets. I have a separate closet for the clothing I wear to work. I am required to wear pants to work so my work closet consist of tops and pants just for work. The other closet which I share with my husband hold my regular wardrobe. • I own more accessories than clothing in my master closet. I had no idea. This makes no sense – but the numbers don’t lie. • I HATE RTW PANTS!! I’ve already got rid of most a few months ago. Sewing pants isn’t easy but now that I’ve have drafted the perfect pattern for my work pants, I think I may try some casual pant patterns. Skirts and dresses will always be my favorite type of clothing to sew and wear. • Forty pairs of shoes. Really?! The sad thing is most was were in a plastic bin so I did not know exactly what I had. I would go in there to dig and say, “Oh, I forgot I had these”. I got rid of the bin. Now every shoes I own is out in the open. I had four similar pairs of high healed black shoes. I thought I only had two pair. Shame. Most of the shoes that went to the trash were because the glue dry rotted. The shoes were either never worn or worn once or twice. • I had no idea I had so many belts. • 72% of my purged items were worthy of donation to Goodwill. I don’t feel all that bad about wasting my money. • I now know what I have, what I need (jackets and self-sewn pants) and what I have too much of. • My husband now own more clothes than me. No, he does not need a purge. All his clothes still fits from college days. Jealous. This bin went directly to Goodwill within an hour. Out of sight, out of mind. I have a clean slate. Maybe now is a good time to start the minimalist wardrobe. I really do want to live with the minimum amount of stuff. The less stuff I want and need, the more money I have to save. I could set boundaries. Maybe have only 20 tops and 10 pants for work clothes at a time? How about setting limits on the amount of RTW in my regular wardrobe? I will be encourage to sew more. I mean, I have lots of fashion fabrics needing to be sewn into clothing. OK, that’s topic for another post about another fabric stash purge later on. Bad habits I will stop are wishful thinking and impulse bargain buying. No more “I will lose weight to fit into these”, “I will repair the damaged merchandise when I get home”, and “this price is too good to leave behind – better get one in every color”. I’ve wasted enough money on these types of purchases. 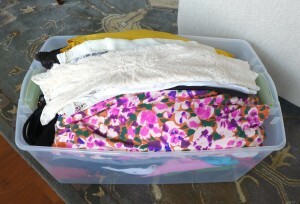 A Sewing Silver Lining: After I re-organized my closets, I realized how far I’ve come with my self-sewn clothing. Six of the eight skirts I sewed myself. Fourteen of the twenty-nine dresses I sewed myself. Go me!! I feel proud that my sewn clothing are becoming a large part of my wardrobe. It makes me feel good about the long hours spent on one each one of them. By the way, not one item I had to purge was self –sewn. I can’t imagine the amount of money spent on the clothing I threw away or donated to Goodwill. Actually, it not worth trying to quantify. Whatever it was, it’s not worth more than how good I feel when I now walk into my closets. Great article! I’m inspired to minimize on my hoard of clutter. Mollie, thoroughly enjoyed the article!